Craig (hubby) had won free tickets from work to see our local hockey team (Let's Go Komets!). We were getting settled in our stadium seats when one of Craig's coworkers sat next to us with his wife. We almost immediately hit it off--even though they were about 15 years our senior, they mentioned the word 'garden' in the usual 'how's the weather' small talk, and an immediate connection was made. I started gushing, as usual, about the various spots I'd found over the years in my tiny yard to garden. I admit, my excitement gets the best of me. Craig chimed in with our plans to plant blueberries, strawberries and asparagus in the front yard in a few weeks. As we spoke of all our endeavors, the couple smiled politely. When they had a moment to interject, they said that they, too, grow blueberries. I asked for advice; what types, how many different types, and their favorites. I said "we hope to plant at least 6 bushes, depending on the space we have." The tiniest flicker of amusement--not unkind at all, and very subtle--flashed in the wife's eyes before she said, "well, we added about a dozen more last year, so I think we are up to 60 bushes--does that sound right, hon?" After my eyes widened and my mouth gaped a bit, I was hit with the realization that these were no urban gardeners. I asked, my voice a bit squeaky, "oh, how big is your yard? ", not knowing just how different our properties were. Crickets were chirping somewhere, but the screams of the crowd as the hockey team started hitting the ice drowned them out. I felt like I was way out of my league, and it's not the first time it's happened. I remember a few years ago, when I was chatting online in one my of garden groups with a fellow compost-maker. I experienced the same kind of moment of humility. I was new to making compost, and had only my spinning compost ball at the time. The miracle of rotten veggie scraps and straw and dead leaves breaking down into beautiful, earthy black gold was brand new to me, and I boasted about the 'whole 2 five-gallon buckets full' I had managed to create. The response to my chirp of excitement? "Oh, we usually turn out about 50 gallons per pile every few weeks." I tried not to do the math when I realized this person had multiple piles and that my 10 gallons had taken a year to cook to perfection. I hung my virtual head in shame and quietly backed out of the online discussion. I felt like the overeager freshman put in her place by casually cooler-than-cool upperclassmen. Similar moments of sobering reality have hit me over the years many times. Those who have bigger places are never out to shame me, I know that; the gardeners I've known are much more interested in sharing than in competition. 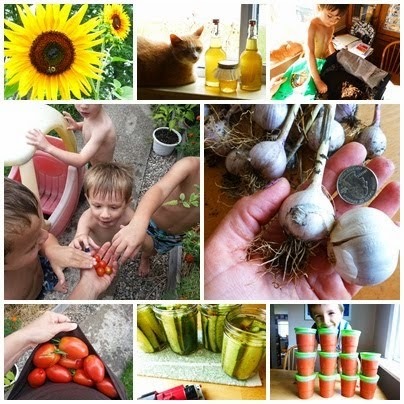 However, it still feels awkward, after so much time spent celebrating every tiny thing that happens on my 1/6 acre, to have a full-blown big-scale homesteader explain just how much they do. It makes a person with a little yard question their motives. If I can only grow enough blueberries from 6 bushes for our family to have a small snack a few times during a summer, then why bother? Why plant a crown of asparagus, wait for years before we can even harvest it, and then have ONE dinner from it? After searching in my humbled garden soul for awhile (this post has tumbled in my head for quite some time), I have thought of a few reasons why, dang gone it, your tiny plot matters. Mine matters, yours matters, we are not just scraping away at, building and loving our soil for nothing. Community seems the obvious number one reason your tiny plot matters, because usually if you have a tiny plot, it means you are surrounded by other plots. Those other plots come with other people. Life in this world is mostly about learning to find your place and get along with all those other humans. I am by nature an introvert, and if I am completely honest with myself, I'd rather putter around in my garden completely alone. Learning to socialize with others is a skill that has taken me 40 years to even start honing, and though I may want to be a hermit, I know that interacting with my community brings amazing gifts to my life. Tending my garden has forced me outside and in the view of neighbors. Gardening is the perfect ice-breaker. A neighbor you never knew existed may suddenly materialize at your fence, curious about the new installation in your yard. A few may be annoyed by your audacity to rip up grass for veggies, but mainly, at least in my neighborhood, others are eager to share a story. "My grandma had a garden." "I always wanted to have tomatoes in my backyard." 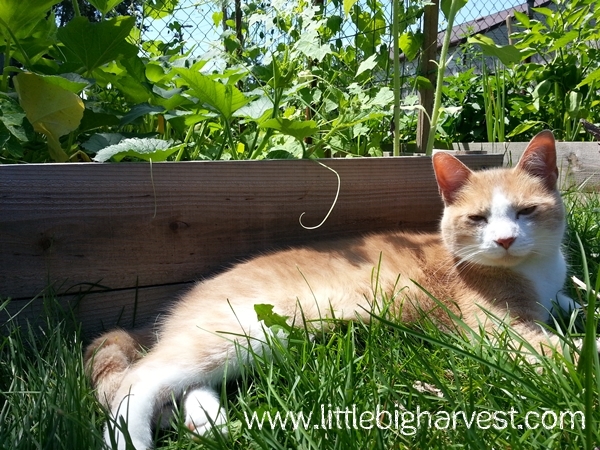 "In my day, the whole yard was a garden and we grew everything." Or, from the neighbor kids; "Can I help?!" Sharing stories, seedlings, and harvests with neighbors is an age-old way to connect with the little community around you, which is becoming more and more important as people stay locked inside with their gadgets and fears. Be the odd duck in your neighborhood whose yard becomes a garden paradise, or, if you have lots of food-growers around you, join their ranks and feel more connected to your yard and your surrounding humans than you thought possible. 2. Showing what is possible. I think about this a lot; the world is not getting bigger, but the population is. Though America is known for its sprawling farmland and open spaces, the fact is, cities and suburbs are getting larger every day and more people are living in smaller spaces. Even if there is technically enough land for each person to have their own acre+ homestead, our current agricultural system accounts for most of the land and it's not realistic to think that every person can own a spacious property with luxurious openness. As our spaces shrink, it might be easy to put all the food power in the hands of our agriculture system, but I think it's an important challenge to stretch the limits of the backyard (and front yard!). Show others the beauty of intensive gardening, of companion growing, and tricks that allow you to produce surprising amounts of your own food. Be a curiosity and an inspiration for others; take back a fraction of your self-sustainability and encourage others to do the same thing. The more people who grow something of their own, the less strain on an agricultural system that, in its current path, is reaching a breaking point. If you have food coming like magic from your own yard, you are much more likely to eat it. Nobody seems to eat enough vegetables, but when you can go outside and literally take a snap pea or a cherry tomato directly from the plant to your mouth, vegetables take on a new allure. Finding ways to prepare and preserve your harvest is a fun challenge. You may also face a disappointment; a crop that just didn't thrive and produce for you, and you may be left with a craving for that particular veggie. This will have you buying more produce from the grocery store, and filling up on more veggies than processed food. Becoming a food grower has this very cool side effect; you start to appreciate vegetables and crave them. There is also very compelling evidence that the act of gardening itself provides health benefits. A popular article online suggests that being with the soil wards off depression, and I've felt the effect myself many times. Just placing your hands into soil, not afraid to get it under your nails--digging around and preparing a growing space is much more than child's play--it has a calming effect unlike anything else I know. Beyond chasing away depression, I recently read an interesting idea that we are literally part of the soil. When we separate ourselves from the dirt, we are not allowing soil particles to infiltrate our bodies. Being outside, stirring up soil and breathing the invisible particles into our lungs provides health benefits we are just starting to understand. Since we evolved with soil, it is part of our very existence. Sound hokie? Please read this book; it's just another in a growing collection that has changed the way I look at my human place in this world. It's a concept I've only come to appreciate within the past five years or so. It sounds fancy and scientific, but it is one of the most important things we can preserve on this planet if we hope to eat into the future; if we hope to survive as a species. Simply put, biodiversity is an insurance policy. The more types of each food we grow, the less likely a new pest or pathogen will annihilate the entire crop. Think Irish potato famine. The implications from that haunting episode in history are still very relevant; yet we have not taken nearly the amount of effort we should to ensure it doesn't happen again. The corn and wheat that form the backbone of our existence come from a tiny handful of species of corn and wheat, and not only that, we grow it in vast monocultures that are like a miraculous buffet to a pest who has newly evolved to resist our pesticides. It is a scary prospect to think we could potentially experience crop devastation nation-wide not unlike the potato famine, which occurred because a mysterious pathogen (later identified as a tiny microorganism, late blight) wiped out the country's entire potato crop for years. All the potatoes were identical. There was no defense, no other type to offer resistance to the pathogen. Every potato, gone; millions starved since potatoes made up the majority of the Irish diet at the time. As more people realize how crucial it is to keep a diverse stash of crop types available as a defense-based insurance policy, saving seeds has become a huge trend. Seed banks have been built and adventurers have traveled the world looking for old types of seeds in order to save them for future generations and to have a wide variety of plant DNA that plant scientists can work with to keep healthy and strong breeds growing. As a backyard gardener with a tiny plot, you are crucial to the seed-saving story. Seeds have limited life and are only able to continue existing if they are actually grown! Growing 'heirlooms' has become popular, and it's a trend I'm happy to follow. You have the power to save biodiversity even if you grow ONE PLANT in your yard--that is one more heirloom seed grown and one more species that has a fighting chance of avoiding disappearing forever (we have lost millions of species of plants that we will never recover). Keeping heirloom 'cool' will help the bigger picture of a biodiverse planet. *Please read This Book for a beautiful explanation of seed saving. It is truly profound and if you read no other book this year, please just read this one. Yes, fun. It is an important reason to get outside and garden no matter if you have 1/10 of an acre or 100 acres. If you have a little space to call your own, you are lucky and it's important to celebrate it. Get off your phone or device and go outside. Digging into the space surrounding you, no matter how small, will not only improve your feelings about your community, it will make you healthier, happier, and more alive. Connect to your little piece of soil. 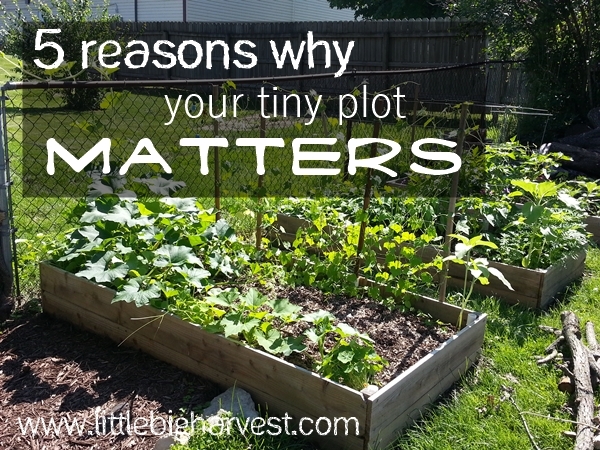 Because dang gone it, your tiny plot matters! Never feel ashamed of your small plot. We all start small, and work up! While I have just over an acre to work, I still have years to go to get my place where I'd like it, but first I need to build up the soil. But as I build up the soil at home, I also start my own plants, and dream big plans for my children's patio gardens for their apartments, and help them realize their homestead dreams. Never feel bad for your tiny homestead! We have a small yard too, and even though the results may be small, the skills are the same. Plus, as you learn and do more, you can start getting a decent amount of food out of tiny spaces. Thanks Kathryn! Your blog is an inspiration to me! It's so nice to know that there are many of us out there practicing homesteading skills on a small scale. Oh, that is awful about the vines/grass. I actually decided not to use the city compost right off the bat because of controversy over its safety. I would rather just make my own compost and know what it's got in it. Thank you for your comment...I hope that you will start a new garden! Honestly, in a world with so much concrete, every little garden plot helps, no matter how small. I hope that my own children will carry on some of my enthusiasm for growing things. I love the support we gardeners all have for one another. Mark Hutchinson is very professional in the field of wild life from many years. Thank you, Christopher! Happy growing to you! I do have a small 50 sq yard plot lying waste from past 2 years. I would certainly grow something there this year. Thank you for your amazing post. Keep up with the good work. This is not an tiny plot for me. Well! you can make use of it in a better way and use aquaponics to utilize space in proper way. replika rolex klockor, som kombinerar elegant stil och spetsteknik, en rad stilar av replika rolex datejust klockor, går pekaren mellan din exklusiva smakstil. Aquaponic/hydroponics. The first method did not require any food for plants as fish wastes will be used as a plant nutrient. Aquaponics system is a ray of hope for our increased population. Traditional farming methods can be very frustrating. Need an Aerogarden for home use? Here is the list of best Miracle-Gro aerogarden reviews 2019.
ever considered moving the growing indoors? any experiences with led grow lights with for this matter? do you grow microgreens? which is best and easy to grow?